Home » Mazda MX-5 Miata » What are the Trim Levels of the 2019 Mazda MX-5 Miata? For its 2019 model, the Mazda MX-5 Miata didn’t undergo a massive redesign but still brought a few welcome and significant improvements to its iconic roadster style. One of the biggest changes was a bump in engine power, making it even more of a joy to ride. Elsewhere, new features have been added while others have been upgraded. We’ll sort out the differences as we explore and compare the trim levels of the 2019 Mazda MX-5 Miata! 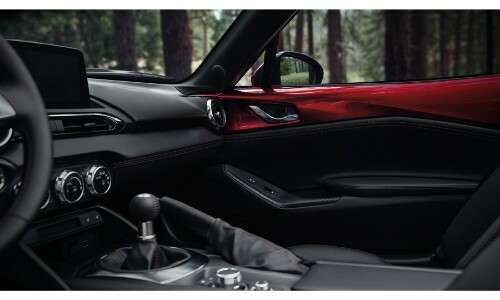 The baseline 2019 Mazda MX-5 Miata Sport trim, like all of the 2019 Mazda MX-5 Miata trims, comes with a newly, retuned engine with more power output than the previous 2018 model. This 2L SKYACTIV®-G inline 4 engine produces 181 horsepower and 151 lb-ft of torque. 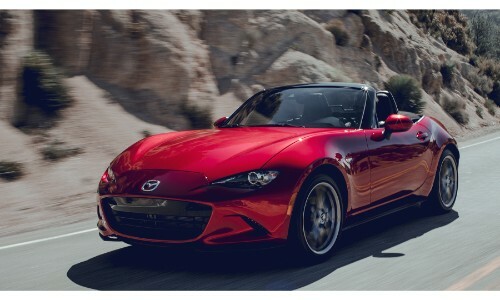 The 2019 Mazda MX-5 Miata Sport has a starting MSRP of $25,730. The 2019 Mazda MX-5 Miata Club has a starting MSRP of $29,590. The 2019 Mazda MX-5 Miata Grand Touring has a starting MSRP of $30,780. Depending on what part of the country you’re reading this from, you might want to wait until winter passes before purchasing a 2019 Mazda MX-5 Miata. For other, warmer climates, just check out your nearest Mazda dealership for assistance. For those in our area of Rochester, New York, feel free to contact us if you have any further questions and to browse our online inventory of additional Mazda models. At Marketplace Mazda, we’re here to help you find the ride of your life! This entry was posted on Thursday, December 20th, 2018 at 2:02 pm	and is filed under Comparisons, Mazda MX-5 Miata. You can follow any responses to this entry through the RSS 2.0 feed. You can skip to the end and leave a response. Pinging is currently not allowed.